Week 121: Experts in authoritarianism advise to keep a list of things subtly changing around you, so you’ll remember. A shocking story by an NBC affiliate revealed U.S. Customs and Border Patrol has been keeping a database of journalists and other activists involved at the Southern border, the second list by the Trump regime targeting U.S. journalists that has been uncovered since Trump came into power. The regime also reportedly revoked an award from a journalist who had been critical of Trump on social media. Several revealing and concerning stories about haphazard U.S. foreign policy were reported, seeming to suggest increasingly that decisions are being made solely by Trump, who continues to show a general disinterest in, and at times hostility towards, both U.S. intelligence and protocols. This week the Commerce Department reported the largest trade deficit in goods in the nation’s history, as Trump’s isolationist policies and trade wars took hold — the federal budget deficit also ballooned, largely as a result of the Republican tax break. On Saturday, The Atlantic reported House Oversight Committee Democrats are poring over the Cohen testimony. Chairman Rep. Elijah Cummings said the transcript is providing a road map for Democrats to follow. WAPO reported in Trump’s first 773 days in office, he has made 9,014 false or misleading claims. Trump has escalated the pace from 5.9 per day in his first year, to 16.5 per day in his second, to 22 per day so far in 2019. A leaked document obtained by NBC station KNSD-TV revealed U.S. Custom and Border Protection kept a secret database tracking 59 journalists and immigration advocates related to the caravans. The database, compiled with the help of Mexican authorities, labeled people as organizers, instigators, or “unknown,” and said they should be targeted for screening at the border. The database included 10 journalists, seven of whom are U.S. citizens, and included 31 Americans in all. Based on symbols on the database, 12 appeared to have been questioned and nine were arrested at the border. On Thursday, according to a statement from Customs and Border Protection, the Department of Homeland Security and the House Homeland Security Committee are investigating whether CBP agents targeted journalists for questioning. Foreign Policy reported the State Department rescinded a “Women of Courage” award for Finnish journalist Jessikka Aro without explanation, reportedly after seeing her social media posts that were critical of Trump. NBC News reported just two days after Trump’s failed second summit with Kim Jong Un, photo imagery by Beyond Parallel revealed North Korea is “rapid rebuilding” the long-range rocket site at Sohae Launch Facility. On Saturday, WAPO reported despite the ongoing investigations of Trump and his failed North Korea summit, Republicans continue to rally around Trump. His ownership of the party was especially visible at CPAC. Republicans cited Trump’s pull in the primaries, a fraying consensus about conservatism as nationalism, an overhaul of the judiciary branch, and a shared disdain of the media and Democrats. Fox News host Sean Hannity said on his show of Trump critics: “I think they put themselves at great jeopardy.” An increase in tribalism was also cited, with a senator saying Watergate might not be prosecuted today. On Sunday, NYT reported that following Trump’s public criticism of their agencies, intelligence chiefs have revamped their presentations to Trump to focus on what he wants to hear about: economics and trade. Intelligence officials giving Trump briefings worked to answer his repeated question of who is winning — meaning what country is making more money. Briefers also use charts and graphs of economic data. Trump has also reduced in-person briefings to twice a week by either director of national intelligence Dan Coats or C.I.A. director Gina Haspel, featuring far more charts and visual aids to appeal to Trump. Trump is easily bored by activities and motivations of secondary foreign officials, and has shown less interest than previous leaders on potential terrorist plots or spy work. Trump only wants information he agrees with. WAPO reported two years in, Trump’s national security officials and Republican allies are struggling to defend and explain his haphazard foreign policy statements — the mantra: it is what Trump says it is. Trump’s foreign policy is described as “part nationalist, part conservative, part isolationist, part militaristic pageantry.” Trump distrusts traditional allies like NATO, slapping tariffs on allies and adversaries. Secretary of State Mike Pompeo has had trouble being in sync on Trump’s statements on North Korea, and trade negotiator Robert Lighthizer was corrected by Trump in front of Chinese officials in the Oval Office. On Wednesday, Trump signed an executive order canceling the requirement that U.S. intelligence officials publicly report the number of civilians killed in drone strikes on terrorist targets outside war zones. Rep. Adam Schiff called it “a troubling retreat from transparency,” and other experts warned the lack of data would give propaganda to Islamist extremists who claim the U.S. acts without regard for civilians. On Wednesday, Russian President Vladimir Putin said his security forces had nabbed 600 spies during 2018, including 129 officers and 465 agents of foreign intelligence agencies. Putin told Russian state news TASS, “Just like before, and now probably even harder, (foreign intelligence services) are trying to influence events in our country,” adding they are seeking to “step up” their activities. Putin did not specify any countries by name. Paul Whelan, a resident of Michigan and a former Marine who was arrested last year on suspicion of espionage, is being held at the Lefortovo detention center in Moscow. On Thursday, Daily Beast reported U.S. embassy staffers in Riyadh said Jared Kushner did not include any embassy officials in his meeting last week with Saudi King Salman and Crown Prince MBS. Additionally, the Saudi government provided security and handled the entire schedule for Kushner and his entourage, responsibilities typically carried out by the U.S. embassy. Little detail of the meeting was given. On Friday, Bloomberg reported the Trump regime is drawing up plans to demand allies, including Germany and Japan and eventually other countries hosting U.S. troops, pay the full price of American soldiers deployed on their soil. On Monday, 21 states and D.C. sued the Trump regime over a rule announced in Week 119 which would prevent family planning clinics that provide abortions or abortion referrals from receiving federal funds. For the third time, Rep. Steve King promoted Faith Goldy, a Canadian white nationalist, in a tweet. Goldy once recommended a book calling for the “elimination of Jews” and has appeared on The Daily Stormer podcast. On Monday, a federal judge said the Trump regime violated the law when it halted the Obama-era Equal Employment Opportunity Commission’s efforts to collect pay data by race and gender from large companies. WAPO reported while Trump invited the NCAA’s Division 2 football champs to the White House, he has not invited any women’s championship teams. Obama, George W. Bush, and Bill Clinton did so numerous times. A poster at an event sponsored by the Republican Party of West Virginia which linked Rep. Ilhan Omar to 9/11 sparked outrage. The poster was put up by ACT for America, classified as an anti-Muslim hate group by the SPLC. On Monday, after tornadoes hit Alabama, Trump tweeted: “FEMA has been told directly by me to give the A Plus treatment” to the red state, in contrast to mismanagement in Puerto Rico, and threats to California. On Monday, HuffPost reported Trump is advancing young judicial nominees who are members of the Federalist Society, and hold ideologies that are extremely anti-abortion and anti-LGBTQ. On Tuesday, the Senate confirmed Allison Rushing, 37, to the federal appeals court. Rushing interned for Alliance Defending Freedom, an anti-LGBTQ group. She was opposed by over 200 civil rights organizations. On Tuesday, a group of male Republican New Hampshire lawmakers wore pearls to a Congressional hearing, seeming to mock mothers of victims of gun violence who also attended the hearing. On Wednesday, a federal judge ruled Commerce Secretary Wilbur Ross violated the constitutional underpinning of representative democracy by adding a citizenship question to the 2020 Census. U.S. District Judge Richard Seeborg in San Francisco also found Ross made a “strong showing of bad faith” by trying to conceal his motives behind adding the question. The judge also said Ross was fully aware that the question would result in a census undercount, particularly among Latinos, adding Ross engaged in a “cynical search” to find an expert who approved of his plan. On Wednesday, the House Oversight Committee opened an investigation into Georgia’s voting problems, sending a letter to Gov. Brian Kemp, who at the time when he ran for governor also served as secretary of state. Issues under investigation included voter purges and suspensions, malfunctioning and hackable machines, and efforts to close precincts and polling places — all of which may have contributed to voter suppression. On Friday, News 4 reported administrators at Sidwell Friends School in D.C. are investigating high school students who included two swastikas and racist imagery in an on-screen presentation made for 500 students. On Friday, Daily News reported school administrators in Bronxville, New York are investigating an allegation that a teacher held a fake auction in which her white students bid on black students pretending to be slaves. On Friday, College of Charleston students walked out of class to protest the school administration’s slow response to a video shot during a First Year Experience class which featured slavery jokes and racist slurs. A police officer in Boulder, Colorado was placed on administrative leave after a video went viral of him drawing his gun on a black student, who works and lives at the property, picking up trash in front of his home. On Saturday, NBC News reported 29 parents who had been deported to Central America by immigration officers returned to the southern border to demand asylum and reunification with their children. The parents have 27 children in U.S. custody, the youngest 5 years-old — some separated from their children for more than a year. Some children are still detained, and others are living with foster families or relatives. Trump also tweeted that the Michael Cohen testimony was “given by a liar to reduce his prison time,” adding Cohen’s “just written book manuscript showed” it’s a lie. Cohen’s lawyer said the manuscript Trump references does not exist. On Sunday, Senate Intelligence ranking democrat Mark Warner told “Meet the Press” his committee has found “enormous amounts of evidence” of potential collusion between Trump and Russians during the 2016 election. On Sunday, House Intelligence chair Adam Schiff told “Face the Nation” that his committee has uncovered both “direct evidence” and “abundant circumstantial evidence” of the Trump campaign colluding with Russia. On Sunday, in the evening, Trump tweeted: “Presidential Harassment by “crazed” Democrats at the highest level in the history,” and “the most vicious and corrupt Mainstream Media” any president has endured. 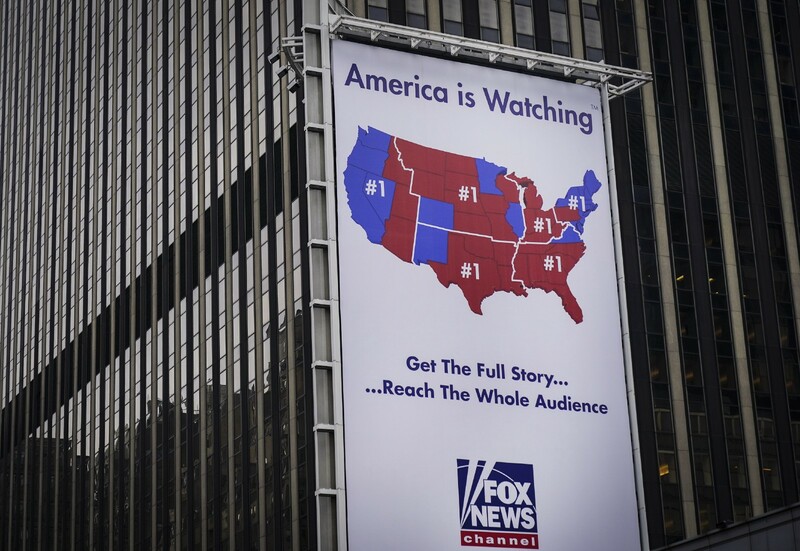 On Monday, an exposé by Jane Mayer in The New Yorker reported on ties between Trump and Fox News, with an expert saying it is the closest our country has come to having state TV. Since Trump took office, he has given 42 interviews to Fox News (7 to Hannity alone), while only giving 10 to the three major television networks combined, and none to CNN. Mayer also reported, citing information compiled by the left-leaning watchdog group Media Matters, that Trump has parroted lines from Fox News shows more than 200 times on Twitter since August 2018. In addition to Bill Shine, Deputy Chief of Staff for Communications, other ex Fox News alumni who worked for Trump include Ben Carson, John Bolton, K.T. McFarland, Heather Nauert, Hope Hicks, and Sebastian Gorka. Shine, who was complicit in a workplace culture of coverups, payoffs, and victim intimidation relating to sexual assault, is still being paid millions from Fox News even while collecting a paycheck from the White House. Trump frequently retweets claims of Fox News during his “Executive Time.” Although press secretary Sarah Sanders has stopped doing daily press briefings, she has appeared on Fox News shows thirty times. Mayer also reported prior to the network’s presidential debate, Fox employees may have alerted Trump that Megyn Kelly was going to ask him tough questions, including on his alleged mistreatment of women. Mayer also reported that in a Oval Office meeting with John Kelly, Trump pressured Gary Cohn to tell the DOJ to block the AT&T-Time Warner merger, over Trump’s ire against CNN. Cohn told Kelly not to follow through. On Tuesday, WAPO reported in a letter responding to Sen. Elizabeth Warren and Rep. Pramila Jayapal, T-Mobile acknowledged it had spent $195,000 at the Trump Hotel DC after announcing a merger with Sprint. T-Mobile spent 14% of its D.C. expenditures over those 10 months at Trump Hotel DC. The T-Mobile-Sprint megamerger will require approval from the DOJ and Federal Communications Commission. On Wednesday, the Democratic National Committee barred Fox News from hosting or televising a candidate debate for the party’s 2020 primary election, a highly unusual rebuke. Chairman Tom Perez said in a statement Fox News “is not in a position to host a fair and neutral debate for our candidates,” citing Mayer’s reporting showing an “inappropriate relationship” between Trump and the network. On Friday, Nancy Erica Smith, lawyer for Diana Falzone issued a statement demanding Fox release her from her nondisclosure agreement so she can talk about getting the Stormy Daniels story before the 2016 election. On Tuesday, WAPO reported that in 2011, shortly after Trump challenged President Obama to “show his record,” the headmaster at New York Military Academy, which Trump attended, was instructed to bury Trump’s record. The academy superintendent, Jeffrey Coverdale, told the Post some trustees gave him a directive to hand over Trump’s records to them, but he refused, instead for the first time moving them elsewhere on campus. Coverdale left the school in 2013, and is not sure what happened after. On the campaign trail, Trump over-inflated his academic success in high school and college. Trump was not an academic standout at the academy. On Sunday, Roger Stone posted an image on Instagram which contained an image of him under the words “Who framed Roger Stone.” The post was up for roughly 24 hours before Stone apparently deleted it. On Tuesday, Judge Jackson blasted Stone in court over his new book that criticizes Mueller, and demanded that Stone explain his efforts to comply with the gag order by March 11. Judge Jackson also chastised Stone’s lawyers for misrepresenting to her that publication of the book, titled “The Myth of Russian Collusion,” was “imminent,” after they admitted the book is already on sale. Judge Jackson will decide whether the book release and/or the Instagram post violate the gag order and justify consequences for Stone. A status conference for Stone was previously scheduled for March 14. On Monday, Jerome Corsi retracted an article he wrote in 2018 for InfoWars and apologized. The article claimed murdered Democratic National Committee staffer Seth Rich was behind leaking DNC emails to Wikileaks. On Monday, House Ways and Means Chair Richard Neal said his committee will likely seek 10 years of Trump’s tax returns, relying on a 1924 law that gives tax-writing committees broad powers. On Monday, the House Judiciary Committee announced it is sending 81 letters seeking information and documents from individuals and groups relating to Trump’s campaign, businesses, transition, and regime. Rep. Nadler said in a statement: “Trump has evaded accountability for his near-daily attacks on our basic legal, ethical, and constitutional rules and norms.” The investigation will focus on obstruction of justice by Trump. When asked by reporters Monday if he would cooperate, Trump responded: “I cooperate all the time with everybody,” adding, “no collusion. It’s all a hoax.” Recipients have until March 18 to respond. On Monday, Rep. Schiff said he has hired Daniel Goldman, a veteran prosecutor in the SDNY with experience fighting Russian organized crime, to lead his committee’s investigation of the Trump regime. Goldman will join two other former federal prosecutors. The House Intelligence Committee will be aggressively investigating whether collusion occurred between the Trump campaign and Russia. On Tuesday, former Trump campaign aide Michael Caputo said he does not plan to cooperate with the House inquiry, and is working with some of the 80 others to begin a joint strategy of resisting requests for testimony. On Tuesday, a new Quinnipiac University poll found 64% of registered voters believe Trump had committed crimes before entering office, and 45% think he committed crimes while serving in office. After Cohen’s Congressional testimony last week, 50% believe Cohen and 35% believe Trump. Just 30% believe Trump is honest, the lowest rating in the poll since Trump took office. On Tuesday, House Oversight Chair Cummings said the White House refused to hand over documents related to security clearances to his committee. Instead, White House Counsel Pat Cipollone offered a briefing. On Wednesday, CNN reported Trump pressured John Kelly and White House counsel Don McGahn to grant security clearance to Ivanka after concerns were raised by the personnel office. After both Kelly and McGahn refused, Trump granted Ivanka and Jared security clearances on his own. Three weeks ago, Ivanka told ABC News that Trump had “no involvement” in her or Kushner’s clearance. On Friday, Axios reported a White House source leaked documents to the House Oversight Committee related to Kushner and Ivanka’s security clearance, after the White House rejected the request. On Monday, NBC News reported Matthew Whitaker, who had been serving as a senior counselor since Attorney General William Barr was sworn in, left the Justice Department. His next move was unclear. On Tuesday, WSJ reported Trump plans to nominate Jessie Liu to the number 3 spot at the DOJ, replacing Rachel Brand who left in February 2018. Liu would be the lone minority woman in DOJ leadership. Liu previously served on Trump’s transition team at the DOJ, and acknowledged she had an in-person interview with Trump before he nominated her to be U.S. attorney, something highly unusual. On Tuesday, NYT reported New York state regulators have subpoenaed Aon PLC, Trump’s insurance broker, following Cohen’s House testimony last week that Trump exaggerated his wealth to insurance companies. The nine-page subpoena served by a state agency which is part of Gov. Andrew Cuomo’s administration demands materials relating to Aon’s business with Trump and the Trump Org dating back to 2009. On Tuesday, NYT reported it had obtained six checks written by Trump while in office of $35,000 each paid to Michael Cohen — one of 11 such payments made to Cohen to reimburse for hush money payments. The dates on the check revealed the parallel lives Trump was leading while in office and conducting the country’s business, while paying for efforts to keep his affairs out of the public eye in the run up to the 2016 election. Cohen claimed the checks started in February 2017 after a meeting in the Oval Office. The first check for January and February for $70,000 was signed on February 14 by Donald Jr. and Allen Weisselberg. On Tuesday, WSJ reported a lawyer for Michael Cohen, Stephen Ryan, approached Trump’s attorneys about the possibility of a pardon after the FBI raided Cohen’s properties in April 2018. Trump attorneys, including Jay Sekulow, Rudy Giuliani, and Joanna Hendon, dismissed the idea of a pardon; however, Giuliani left open the possibility that Trump could grant one in the future. Ryan also approached Trump Organization general counsel Alan Garten and outside attorney Alan Futerfas. Ryan left the impression if Cohen could not rely on a pardon, he might cooperate with SDNY prosecutors. Conversations among parties on this topic are being probed by the House Judiciary Committee, and were part of their document requests made on Monday. On Tuesday, NBC News reported the House and Senate intelligence committees are also investigating the pardon discussions. It is not clear how serious the discussions were, and no pardon was granted. On Wednesday, Cohen gave the House Intelligence Committee documentation showing edits to the false written statement he delivered to Congress in 2017 about the Trump Tower Moscow project. Cohen claimed in his testimony that Trump attorney Jay Sekulow made changes to his statement to the House and Senate Intelligence Committees, and that it was also reviewed by lawyers like Abbe Lowell. On Thursday, ABC News reported Congressional lawmakers are planning to ask Donald Jr. to return to testify about the Trump Tower Moscow project, after he said he knew “very little” about a deal in prior testimony. On Thursday, Cohen sued the Trump Organization, saying the company is obligated to pay both his $1.9 million in legal bills, and another $1.9 million he owes as part of a criminal sentence. Cohen said the company paid his legal counsel — at the time, McDermott Will & Emery LLP — but stopped covering the fees they are contractually obligated to pay after he started cooperating with federal investigators. On Friday, Fox News reported Democrats on the House Intelligence Committee traveled to New York to meet with Cohen at least four times for over 10 hours before last week’s public testimony. On Monday, Senate Leader Mitch McConnell said he would not stop passage of a resolution to block Trump’s national emergency declaration, after Sen. Rand Paul became the fourth to say he would vote for it. Sen. Paul said as many as 10 Republicans may vote for the measure, a serious rebuke to Trump and rare example of Congress standing up to try to rein in his power. Trump is likely to veto the measure. On Tuesday, the Treasury Department announced the federal budget deficit grew by 77% in the first four months of fiscal year 2019, amid falling revenue caused by Trump’s tax cuts and higher spending. On Wednesday, General Motors closed a massive assembly plant in Lordstown, Ohio — a plant that had operated for 50 years. This marks the first time GM will not be manufacturing cars in Ohio in half a century. GM also plans to close plants in Detroit and Oshawa, Ontario, and transmission plants in Warren, Michigan, and near Baltimore. On Thursday, the Commerce Department announced the U.S. trade deficit in goods with the rest of the world in 2018 rose to $891 billion, the largest deficit in U.S. history. The overall trade deficit grew 12.5% from 2017 to $621 billion. American exports to China slumped nearly 50% in December from the year prior, as the trade gap in goods overall for 2018 with China reached $419 billion. On Wednesday, Secretary of Homeland Security Kirstjen Nielsen testified before the House Homeland Security Committee about Trump’s “zero tolerance” policy — Nielsen’s first hearing since Democrats took control. Nielsen backed Trump’s emergency declaration, saying, “this is not a manufactured crisis. This is truly an emergency,” and claiming the number of immigrants entering the U.S. illegally had doubled from a year ago. Also Wednesday, DHS acting inspector general John V. Kelly said in a separate hearing he has opened three investigations into the Trump regime’s immigration policies, including tracking separated children. When Rep. Nanette Barragán asked, “You let kids be separated without tracking them. Do you know how outrageous that is…You have no feeling, no compassion, no empathy here,” Nielsen did not respond. On Thursday, AP reported that the Pentagon may use $1 billion in leftover funds set aside for military pay and pension accounts to pay for Trump’s wall. The funds are currently available since recruitment is down. CNBC reported the firm owned by Trump’s former longtime bodyguard Keith Schiller was paid $225,000 by the Republican National Committee for security consulting since he left the White House in September 2017. The RNC claimed Schiller was kept on to “work on other security needs for the committee” for the 2020 convention. It was unclear what that work entailed. The RNC fee to Schiller is $15,000 per month. On Friday, The Guardian reported Trump’s inauguration committee took money from shell companies tied to foreigners. It is illegal for non-resident foreigners to donate to political campaigns, including inaugurations. The Guardian identified three payments of $25,000 each, coming from an Indian real estate investor, a lobbyist with ties to Chinese investors, and an Israeli with international links. On Thursday, the House voted 407–23 on a measure to condemn all forms of hate, sparked by a fierce debate between Democrats following comments by Rep. Ilhan Omar which were viewed as anti-Semitic. Trump has been silent to the same in the GOP and trafficked in anti-Semitic tropes. Republicans were silent this week about Rep. Jim Jordan’s tweet, in which he replaced the letter “s” with $ in spelling Tom Steyer’s name. On Thursday, Judge T.S. Ellis III sentenced Paul Manafort to 47 months in prison, dismissing sentencing guidelines of 19 to 24 year as “vindictive” and “way out of whack” for 69 year-old Manafort. Legal experts criticized Ellis’s sentence, saying wealthy white-collar criminals often receive lighter sentences because the judge empathizes with them. Manafort arrived in court gray-haired and in a wheelchair. The judge had predicted some pushback. However, his sentencing provoked a social media firestorm including public defenders, prosecutors, and ordinary citizens — citing racial disparity in sentencing as well. Observers also noted Judge Ellis showed his distaste for special counsel throughout proceedings. Judge Amy Berman Jackson will sentence Manafort next week on two conspiracy charges. On Friday, in a series of morning tweets, Trump said, “Thank you @foxandfriends. Great show!” Trump did not publicly change course despite earlier reporting by Jane Mayer on his ties to the network. Cohen responded, tweeting: “Just another set of lies” by Trump, adding since it was International Women’s Day, Trump should apologize for his “own #lies and #DirtyDeeds” to Karen McDougal and Stephanie Clifford. Visiting Alabama, Trump signed Bibles while visiting relief sites. The act of signing Bibles drew mixed reviews from clergy, with some saying it was appropriate, while others said Trump was wrong to do so. On Friday, ex-Fox News executive Bill Shine abruptly resigned from the White House, after nine months on the job. Shine said he will now work as a senior advisor for Trump’s 2020 re-election campaign. Shine was Trump’s fifth communications director, as Trump continues to believe he does not need one. The move, after Mayer’s reporting, came as a surprise to White House aides and officials on the Trump 2020 campaign. On Friday, Air Force Secretary Heather Wilson resigned to become president of the University of Texas at El Paso. Wilson was seen as a candidate to replace Jim Mattis in the still unfilled defense secretary spot. On Friday, Trump formally nominated former oil and gas lobbyist David Bernhardt to succeed Ryan Zinke at the Interior Department. Bernhardt was been the acting secretary since Zinke’s departure. Congressional Democrats who have tried to conduct oversight said acting secretary Bernhardt claimed said he could not provide his calendar, because he has not maintained one in years and is not legally bound to do so. On Friday, Trump allies on the House Judiciary Committee revived allegations of FBI misconduct, publicly releasing a transcript of an August interview with DOJ official Bruce Ohr. On Friday, the Miami Herald reported Li Yang, the founder of Orchids of Asia Day Spa, posed with Trump for a photograph at a Super Bowl party, 19 days before Robert Kraft was arrested for soliciting prostitution. Yang said she no longer owns the spa, which has been accused of human trafficking. Yang also posted a photo with and signed by Trump on her social media from a fundraiser at Mar-a-Lago on March 2, 2018. Mother Jones reported Yang and her husband, Zubin Gong, started GY US Investments LLC in 2017, which on its website in mostly Chinese, offers services for clients looking to make high-level connections in the U.S.
Yang’s bio photo on the website is a photo with Trump with his signature, and says she is a member of the “Presidential Fundraising Committee.” Yang donated $42,000 to a Trump PAC and $16,000 to his campaign. Yang’s Facebook page, since taken down, included photos of her with Donald Jr., Rep. Matt Gaetz, RNC Chair Ronna McDaniel, Transportation Secretary Elaine Chao and Florida Gov. Ron DeSantis among others. The GY US Investments website also lists upcoming events at Mar-a-Lago. Photos show Chinese executives at the Mar-a-Lago New Year’s event mingling with Trump family members including Eric and Donald Jr.
ProPublica reported on another case of Trump’s buddies from Mar-a-Lago being given inside access: Albert Hazzouri, a dentist from Scranton, PA, whom Trump had previously called out at a rally for being a good golfer. On Friday, in an interview with Al Jazeera, Erik Prince admitted he attended an August 2016 Trump Tower previously reported by the Times in Week 80, that also included Donald Jr. and George Nader. Reportedly at the meeting, Nader said the UAE and Saudi Arabia wanted to help Trump win the White House. When asked why he did not disclose the meeting to Congress, Prince said maybe they got the transcript wrong. A bombshell exposé by Jane Mayer, “The Making of the Fox New White House,” explored ties between Trump and the cable-TV network, asking if America had its first state TV.